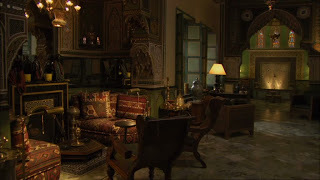 Yves Saint Laurent, with his partner Pierre Berge, joined the “in” crowd of the late 1960s — people like Mick Jagger and Marianne Faithfull, fashion designer Loulou de la Falaise, J. Paul Getty Jr. and his beautiful wife Talitha — in Marrakech, where he could walk the dusty, chaotic streets unrecognised and indulge in his appreciation of Islamic art and architecture. 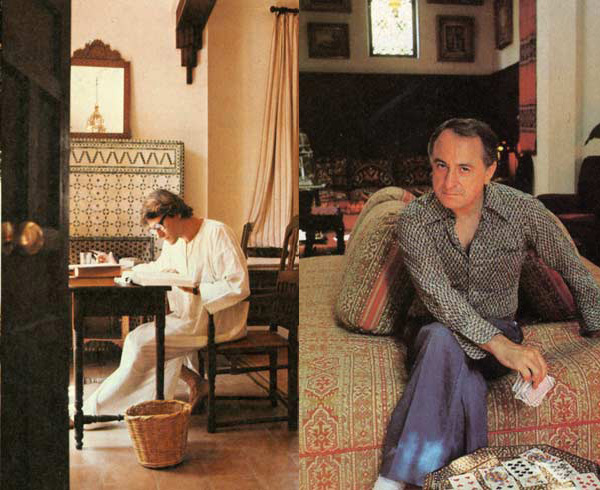 Saint Laurent ended up owning several homes there over the ensuing years, and turned to designers like Marrakech resident Bill Willis and Jacques Grange for the design of these homes. 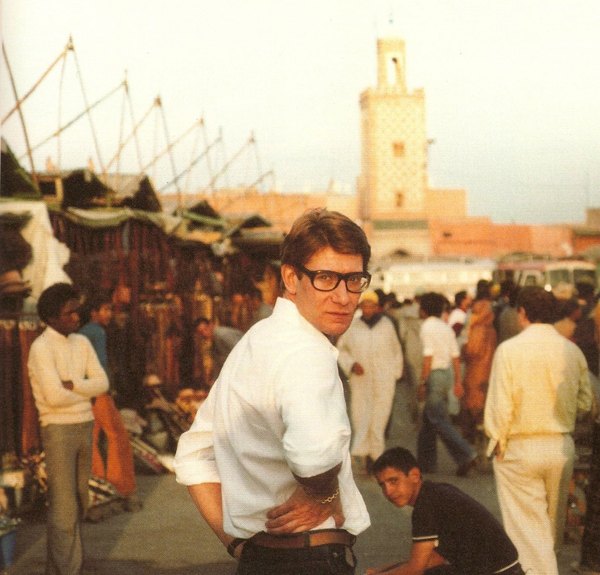 Yves Saint Laurent in Djemaa el Fna Square in Marrakech. 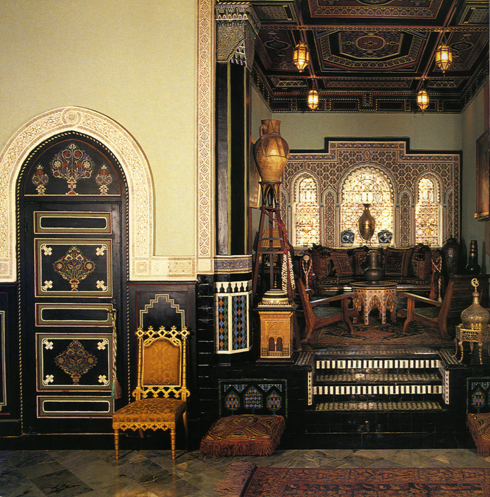 The stunning Mauresque entrance hall. 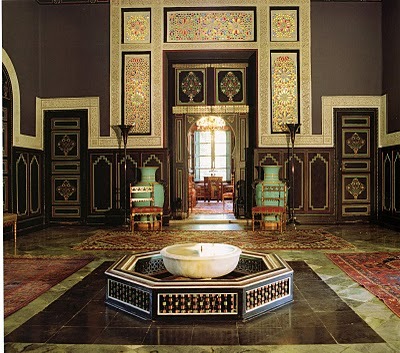 An interior fit for a Moroccan sultan. 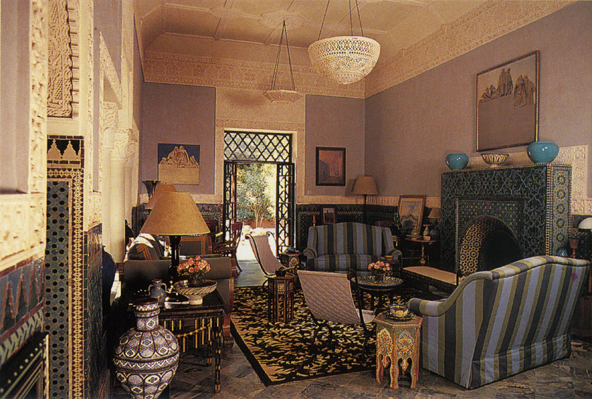 Sitting room in the Dar es Saada. A blend of comfortable upholstered furniture and Moroccan details. 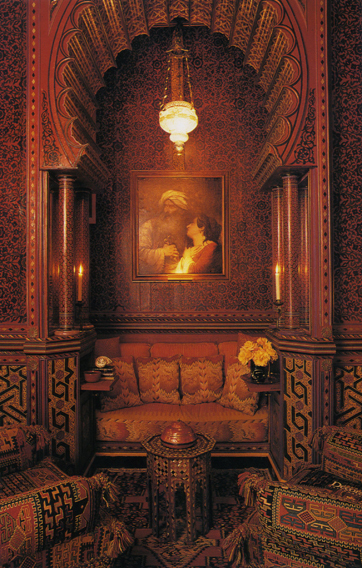 Bill Willis took Orientalism to its zenith inthe library of Saint Laurent’s Dar es Saada. 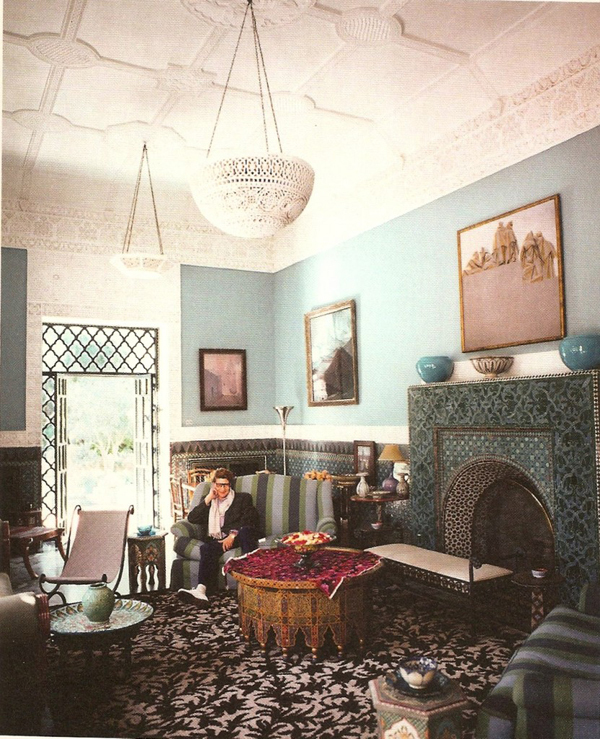 The blue bedroom and the library designed for Dar es Saada by Bill Willis — Willis said the library was his favourite of all the rooms he’d ever decorated. The stunning living room by Bill Willis — a harmony of blues and mauves. 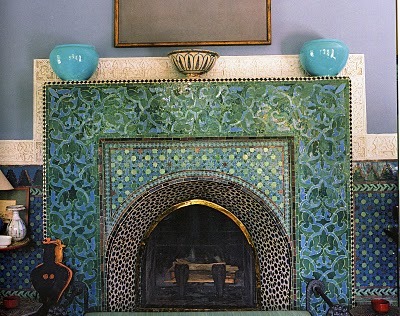 Willis was known for his intricate zellig tiled fireplaces. The blue and mauve colour scheme was used to great effect by British designer David Collins in his design for the Blue Bar at the Berkeley Hotel in London. It’s both tranquil and elegant. A detail of the living room’s fireplace. Willis worked out the design in intricate detail on paper before the tiles were specially coloured and fired, then cut out and fit my a master Moroccan tiler. Saint Laurent at his desk and Berge in one of the living rooms. 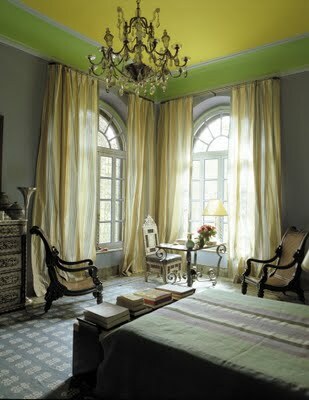 I love the simplicity and the combination of soft blues and unexpected yellow on the ceiling and in the striped curtains in his Marrakech bedroom. It would be like waking up to the sun every morning. The guest bathroom — if I showed up as a guest and my bathroom looked like this, I’d never leave. 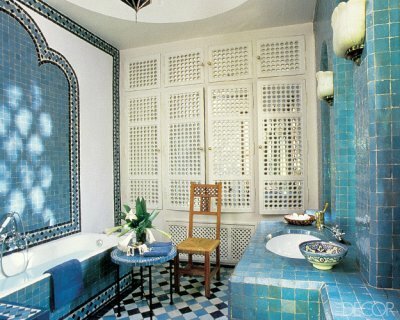 I love the turquoise tiles around the sink and intend to use this idea one day myself. 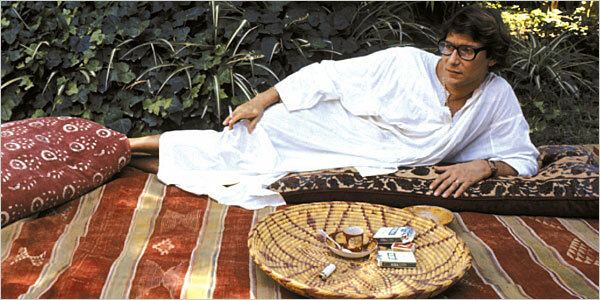 Saint Laurent in his garden. Far from the madding crowd. 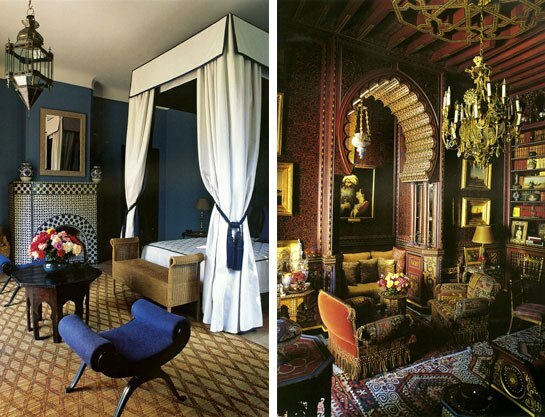 This entry was posted in architecture, Bathrooms, Bedrooms, Bill Willis, Colours, inspiration, Interior Design, Interiors, Living Rooms, Marrakech, Morocco, Yves Saint Laurent and tagged Bill Willis, interior decoration, Interior design, Marrakech, Moroccan design, Morocco, Yves Saint Laurent, zellige. Bookmark the permalink.